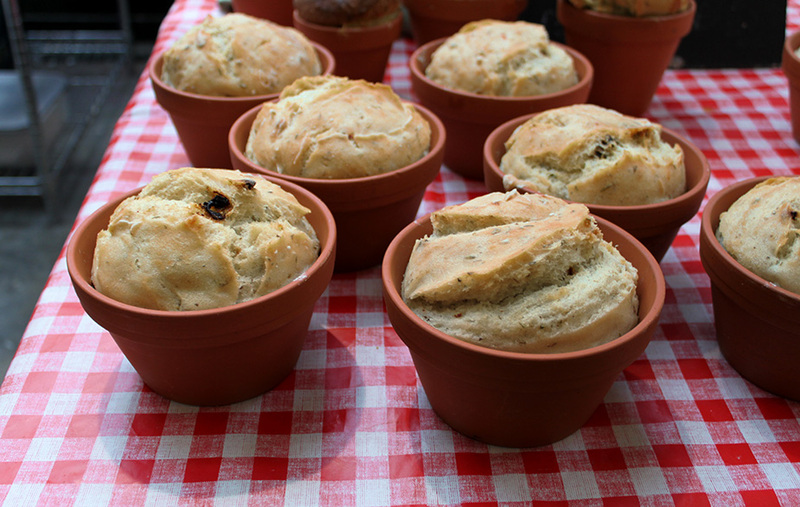 Using a terracotta flowerpot as a mould for your bread is the old fashioned equivalent to the trendy ‘cake in a mug’ that will give your children the perfect excuse to get involved in the kitchen. You can make just about any kind of bread you think of and adapt regular recipes to ‘wild bread’ versions: just add hogweed or fennel seeds, 1 or 2 tablespoons of finely chop wild garlic or add blackberries and bilberries for fruity bread. The sky is the limit! Always use new flowerpots and not ones that have already been used for plants, which is just common sense, but worth mentioning. The pots need to be seasoned the first time you use them to prevent them drawing all the moisture from your dough. Seasoning your pots is easy: just wash them in soapy water and allow to dry at room temperature. Then, rub the pots with vegetable oil and bake at 180°C for 30 min. (It can be done while baking something else, as that will save energy). Remove from the oven, allow to cool and repeat the process again. We are ready to bake bread now. Dissolve the yeast into the warm water and leave to rest for 10 min. Mix the flour and salt in a bowl and make a well in the centre. Knead for 5-10 min until the dough is smooth and elastic. Leave the dough to rest in a lightly-oiled bowl, cover and prove in a warm room for an hour until it doubles in size. Turn the dough out onto a surface and knead again for a minute to knock out the air. Gather the dough together and divide into two to fill your butter-greased pots. Cover the pots and leave them in a warm room to allow the dough to rise. Preheat an oven to 180°C and bake at 200°C until golden on top or about 40 min. Allow to cool and serve. Enjoy! Desde luego queda una idea de lo más original! ¡Y además está muy rico!